2015 Jaguar XF 2.0 i4D 180 auto review | What Car? These are exciting times at Jaguar. The XE, the firm’s exciting and hugely likable compact exec, is still wet behind the ears and in a matter of months we’ll have the phenomenally good-looking F-Pace – the first SUV to ever don the Jag badge. If that weren’t quite enough, the firm has found the time to completely overhaul the XF, the car responsible for kickstarting its design revolution almost a decade ago. The XF still squares up to the BMW 5 Series and Audi A6, but the positioning of the XE beneath it – and the shared use of its new adaptable aluminium platform – means that the XF now comes with more room for rear-seat passengers. The new car is slightly shorter overall, but its wheelbase has grown by 51mm and the rear overhang is slightly longer. The styling hasn’t been altered fundamentally, though, which means the XF and XE look very similar. That’s no bad thing, nor are the significant weight savings that have been achieved by giving the XF many of the XE’s underpinnings. The new XF is as much as 190kg lighter than the old car, thanks in part to the new 2.0-litre, four-cylinder Ingenium diesel engines. As with the XE, the XF will be available from launch with two versions of the new diesel, with more powerful six-cylinder options also on offer. When combined with the six-speed manual gearbox, the lower-output 161bhp 2.0D emits only 104g/km of CO2 and averages 70.6mpg. That’s class-leading. True, that engine’s down on power compared with the best of the opposition, so the most popular XF is likely to be the more powerful 178bhp model tested here, paired with an optional eight-speed automatic. The XF will be available in Prestige, R-Sport and Portfolio trims, with the most expensive S version available only with the six-cylinder engines. 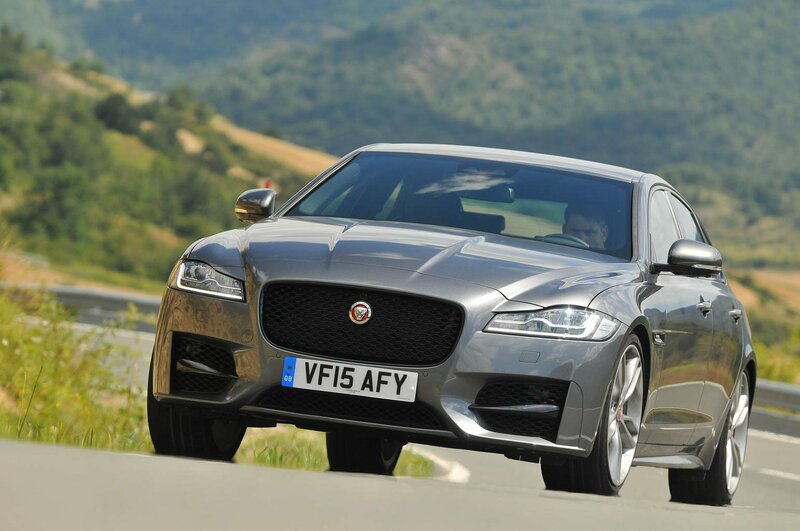 What's the Jaguar XF 2.0 i4D auto like to drive? The smaller Jag XE handles exceptionally well, and it comes as no surprise to learn that the XF rewards its driver almost as much. What may surprise is how well the bigger Jag rides on optional 20in wheels and sports suspension at all speeds. Combined with an engaging and very precise power steering setup, the XF excels at the kind of fast, long-distance driving that executive cars are used for. The more powerful Ingenium engine is well geared for high-speed cruising. It is a little too noisy when revved hard, though, and the XF is less well isolated from road and wind noise than the best of the competition. It is, however, noticeably more solid in feel than its predecessor. The new aluminium platform has eradicated much of the flex that afflicted the previous XF, its inherently greater rigidity also helping to damp away unwanted vibrations. The Jag also has a near-perfect weight distribution, which means it still delivers that pleasing sense of balance, grip and composure we’ve come to expect from a rear-wheel-drive Jaguar. What's the Jaguar XF 2.0 i4D 180 auto like inside? Our car was supplied in the R-Sport spec, which is distinguished by a subtle bodykit and firmer sports suspension. The XF’s cabin has undergone a far more telling overhaul than the exterior. You still have the rising gear selector dial, the broad centre console and the balletic air vents, but the cabin now looks very similar to the XE’s. Take the new climate control switchgear and the optional 10.2in infotainment display, which are considerable improvements on the items in the old XF. The dashboard design is a little different, with the XF getting a slightly more imposing hooded arrangement and the kind of horizontal crease recently favoured by BMW. The quality of materials has been given a boost and the seats are comfortable and supportive in decent measure. The steering wheel comes from the XE and F-Type and adjusts electrically; finding a suitable driving position won’t take long and there’s plenty of head-, leg- and shoulder room once you’re settled. That impression will also be shared by those in the back. Jaguar claims 15mm more leg room compared with the outgoing XF and, despite a lower roofline, 27mm more head room. Jaguar says it beats the 5 Series’ on rear leg room – although only by 3mm. Certainly it feels competitive with our perennial favourite. The Jag’s boot space also beats the BMW’s by a small margin: 20 litres, while the XF’s load-through option, which allows the back seats to drop, hatchback-style, to allow longer loads to be carried, boosts practicality significantly. The old XF was a good car, but it was let down by some build quality and refinement issues, a shortage of rear space, poor fuel consumption and its slow infotainment system. All have received attention in the new car, and it’s now considerably closer to taking the class lead. The original XF was also enjoyable to drive, but it is a much more practical package now. Put simply, this is a Jag which makes more room for its passengers and carries them farther between fill-ups. It remains well-equipped (climate control, Bluetooth, a DAB radio, sat nav, parking aids, cruise control, auto wipers and headlights are all standard), is better made than ever and very competitively priced at £36,850 for the car we tested, and £32,300 for the entry-level version. Choosing the more powerful Ingenium model with bigger wheels (as most buyers will) lifts the XF’s CO2 emissions close to that of the equivalent 5 Series, and we wouldn’t be surprised if that car turns out to be a little quicker off the mark and quieter in a head-to-head test. Nevertheless, by delivering another great driver’s car, Jaguar has reinforced the widely held belief that it is one of the leading executive car makers. The fact that the XF is now a more polished and refined car might just be the excuse many need to finally find out what all the fuss is about.